Paratus Familia Blog: It's as plain as the nose on your face! Recently, I was trying to explain to one of my children, the error of her ways. She did not seem to understand the point that I was trying to make and in frustration I said, "Why can't you understand this? It is as plain on the nose on your face!" And then it hit me - she can't see the nose on her face! At least, she can't see her nose without looking in a mirror. At that moment, I realized that I am my children's mirror. My beautiful daughter had a wart on her nose. It was quite evident to anyone who saw her, but she herself had no idea that it was there. I had seen it growing for quite some time, but because it was on her nose, I assumed that she would see it and take care of it herself. Instead, it just kept growing. It wasn't until it grew big and ugly that I decided to intervene. I told her about her wart, but I didn't do it gently or lovingly. I merely said, "why don't you do something about that ugly thing? You can't leave it there - it repulses everyone who sees it!" She reacted with disbelief. "I don't have a wart. I don't know what you are talking about!" And then came my frustrated response - "What do you mean you can't see it, it is as plain as the nose on your face!" In that instant, I had complete clarity of thought. You can't see your own nose. Try it! Look down, look sideways, look cross-eyed. You won't see your own nose, much less anything as uncomely as a wart. And yet, your nose and everything on it will be perfectly obvious to everyone else. In that moment, I realized that in order to see our nose, we need a mirror. What is obvious to everyone else, requires reflection in order for us to see it clearly. As I stood looking at my daughter, I saw that she needed me to be her mirror. She needed me to gently lead her to her refection and say, "honey, you have a wart that is growing on your nose. I know some ways to make it smaller and eventually clear it up. The sooner we start treating it, the sooner you will have your clear, beautiful complexion back." I had expected the impossible. I had expected my daughter to see something that, to her, was invisible. I had not only expected her to see it, but then to treat it, without proper training. As I regrouped and gently led my daughter to her reflection, God gently led me to mine. As I read His word, I began to see warts on my nose. Not just one wart, but many. Some were small and easily treatable, but some had been growing for a long time. They were plain to everyone around me, but I had no idea they were there. They were as plain as the nose on my face, yet I had never seen them. 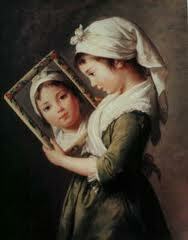 I needed my loving Father to gently lead me to my reflection and then teach me how to treat the ugly growths on my face. Now, as I see people walking around with huge warts on their nose, I realize that they have no idea that they are there. I see, that although my warts are obvious to them, they are unable to see their own. I see that maybe your nose isn't so plain after all. "O would some power the gift to give us to see ourselves as others see us." He wrote this poem after seeing a louse crawling on the hat of a fashionable woman. Seems to fit in well with what you wrote, Enola. It takes love and courage to lead another person to see herself as she is, and it takes even greater courage to listen. As usual, Enola Gay, you have beautifully expressed a meaningful lesson. You should write a monthly column for Woman's Day magazine or some other publication that would pay you for your wisdom. You could provide a whole new perspective for women - a wholesome one. again you have provided food for thought, and it has been digested well.